The Theories and Practices of Some Noted Singers and Actresses. A cablegram printed in the Tribune a few days ago said that Mrs. James Brown Potter had abandoned the corset. Mme. Emma La Jennesse-Albani-Gye’s apartments at the Grand Pacific were as bright as a glowing fire when the reporter called. When “corsets” were mentioned a slight frown deepened in the clear gray eyes, but it passed as quickly as it came, and in her musical voice Mme. Albani gave her views. There was an all-pervading odor of roses and white hyacinths through Mme. Nordica’s apartments at the Richelieu. The songstress lay wearied and nervous beneath the eiderdown while her devoted sister tenderly bathed her throbbing brow. The dainty little lady mother sat amid the ruins of Madame’s floral offerings and chatted. “Does she substitute a stiff waist?” “No; she simply wears a thin silk waist, without a suspicion of whalebone in the back and the merest hint of it at the front and sides. We make them all ourselves, so you may be sure they are simplicity personified. Considering that a fierce rainstorm was raging without, Miss Rosina Vokes was making a cool request of her notably loving hubby. Mr. Clay merely grinned quietly and sank back further into the recesses of the carriage, shutting his eyes as an indication that his ears were closed. Just then Mr. Clay opened the eye and directed an aside to his wife. 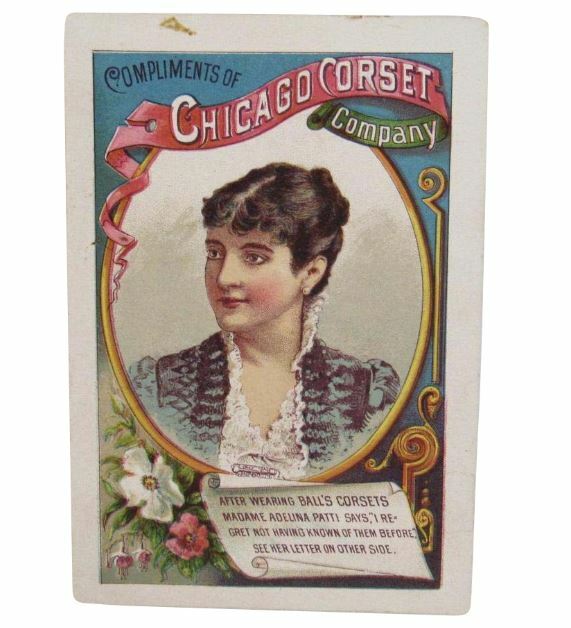 When Mary Anderson was here a Tribune reporter called on her in reference to this all-round question of corsets. Miss Anderson, in her artistic house gown, looked as innocent of stays as Perdita. “Corsets? Of course I wear them. Who does not? Think of me as ‘Nadjy’ with nothing to tie those black spangles to. I’d drop to pieces,” said Miss Janson. [Miss Marie Jansen] “Then the Tribune might ask its readers to listen to the ‘Tale of Woe’ in earnest. Are they an inconvenience? Look!” She got behind a door in the parlor of the Grand Pacific hotel, and after a furtive glance down the corridor, daintily kicked the palm of her outstretched hand, executing a pirouette after it. “I’m all right and my stays are as taut as a sail in high wind. Sometimes I have wondered what would happen if the strings should break. ‘Listen to the Tale of Woe,’” she hummed, casting her eyes meditatively on the chandelier. “Pauline Hallo wears them, too, and all the chorus girls. Some of them would be sad figures if they didn’t. ‘Listen to the Tale of Woe.’ Of course, anyone who sings must wear them loose. I have one now, but look.” She took a deep breath which distended the region just above her fluttering heart that is nightly clasped in a jet black vise, and trilled airily “Listen to the Tale of Woe,” and had plenty of breath to spare after the effort. Mrs Daffodil’s Aide-memoire: Operatic ladies, were, of course, known for their famously opulent figures; some even said that slimming cost them their voice. It is rather fascinating that four out of the six ladies who weighed in, insisted on the benefits of corsets. Reform Dress did not make much headway among denizens of the stage. Adelina Patti was, of course, the prima donna assoluta of nineteenth-century opera. She was one of the financially shrewdest theatrical ladies of her day and, as we see from the advertising card at the head of this post, she endorsed the California Corset Company. Madame Nordica was the so-called “Yankee Diva,” Maine-born Lillian Nordica, another opera star, famous for her collection of husbands and jewels. “Listen to the Tale of Woe” was the signature tune of the once wildly-popular opera Nadjy. Mrs Daffodil has previously reported on gentlemen, including actors, who wear corsets as well as the controversy over tight-lacing, The Flapper and Her Corset, and “The Autobiography of a Corset,” as well as several other posts on this absorbing subject, which may be found by looking under the “corset” filing tab. This entry was posted in Corsetry, Fashion, News and Announcements, Professions, Theatre, Victorian and tagged Adelina Patti, Lillian Nordica, Madame Albini, Marie Jansen, Rosina Vokes, Victorian actresses, Victorian corsetry, Victorian corsets, Victorian musical theatre, Victorian opera singers on August 16, 2017 by chriswoodyard.